Lasers for pigmented lesions are roughly divided into three categories depending on their color as described below, or two categories by chromophores (melanin, water). With a three level energy system, ruby laser has lower energy efficiency, compared to other solid-state lasers, when the electric power applied to a flashlamp is converted to light energy. Its penetration depth of less than 1mm is also inadequate for treatment of pigmented lesions located under the dermal layer. Compared to the ruby laser, alexandrite laser has a deeper penetration depth with about 50-100ns pulse duration, but provides an almost comparable effect on pigmented lesions by melanin. 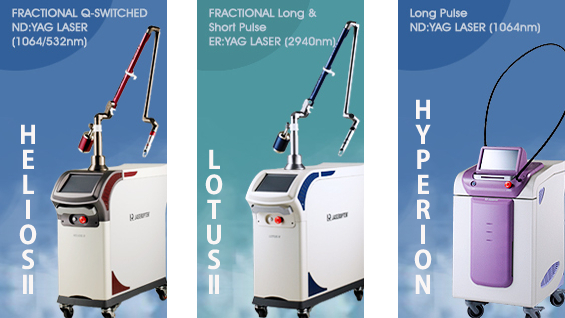 Nd:YAG laser has a pulse duration of about 5-10ns, and the wavelength of 1064nm provides the deepest penetration depth among medical lasers, allowing the treatment of pigmented lesions deep in the dermis, such as the nevus of ota. As mentioned above, the wavelength of 532nm with a shallow penetration depth is effective on pigmented lesions in the epidermis. The two wavelengths can be projected, with great efficacy, for pigmented lesions developed by melanin in the dermis and epidermis. Treatment of melasma can also be greatly improved by applying fractional photothermolysis, a new concept gaining much traction recently. To remove externally injected dye, predominantly tattoos, two things should be assessed in advance. First, the color, and second, the depth of the dye. For example, a tattoo of black dye, injected deep in the dermis, is not treatable unless a 1064nm Q-switched Nd:YAG laser is used, because other lasers mentioned earlier are not capable of reaching the target dye. The injected dye is generally composed of very small particles, only Q-switching lasers with a very short TR (<10-6 seconds) can selectively destroy the dye, without harming the surrounding tissue. The color and depth of a dye are important for eliminating a tattoo. For example, a red dye reflects red light only and a green dye reflects green light only and that is how we can distinguish colors. When eliminating a red tattoo, a red light laser, such as ruby laser, is reflected and does not act on the dye at all, providing no therapeutic effect. <Table 11-2> shows efficacy by laser type. The above mentioned lasers can selectively destroy pigments for the treatment of pigmented lesions, but pigmented lesions in the epithelium – such as solar lentigines – can be eliminated by using the absorption characteristics of water for epithelial ablation. The Er:YAG laser and CO2 laser are used for this purpose. Er:YAG laser has very high accuracy for skin ablation and causes fewer side effect with a lower thermal profile as opposed to CO2 laser. CO2 laser, on the other hand, has a very strong thermal profile, and PIH or scarring may occur when a high output is applied.